2012 turned out not to be the end of the world, but it still was a year that many Big Tech companies would rather forget. 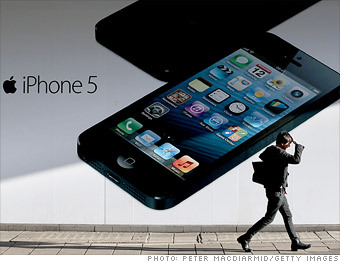 Apple began 2012 with expectations for another stellar year. The company had the iPhone 5 and three new iPads -- including the iPad mini -- in its back pocket. Investors ate it up, sending the company's stock up as high as $705 on Sept. 21. Then Apple's year took a turn for the worse. Its new Maps app turned out to be a disaster and a PR nightmare. A week later, Apple (AAPL) announced that the first weekend of iPhone 5 sales were less than stellar. The next month, Apple turned in its second consecutive quarterly earnings report that missed Wall Street analysts' expectations. Investors panicked, and the stock sunk by nearly 30% from its 2012 peak. IPhone 5 and iPad sales were marred by supply shortages. After months of long delays, Apple is now finally able to satisfy customers' demand for its gadgets, though the wait for an iPad mini remains one week on Apple's online store. But that's a mixed blessing: Cheaper devices like the iPad mini and older versions of the latest gadgets -- including the iPad 2, iPhone 4S and iPhone 4 -- are popular with customers and are eating away at the full-priced iPhone 5 and iPad sales. The stock has ended its free-fall, but Apple exits the year with some serious questions about its ability to innovate in a post-Steve Jobs world.